Girl Scouts of Nassau County (GSNC) is counting down to the start of our Centennial Celebration! During the 2018-2019 Girl Scout year, we will be celebrating 100 years of Girl Scouting in Nassau County! Join us for our Centennial Celebration year. Congratulations to all our Robotic Teams! 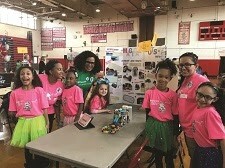 Thanks to our coaches and mentors, the Girl Scouts of Nassau County’s robotics teams had a fantastic year! We thank them all for their dedication and for the example they set for the girls. Here are the results of our 2017 – 2018 season: FIRST® LEGO League Junior (Jr. FLL) 6-9 years old: The Magical Bots and The Sassy Hot Dogs attended the SBPLI’s FLL Jr. EXPO, where the girls showcased their LEGO robot design and research. The Magical Bots were awarded the OUTSTANDING TEAMWORK AWARD and The Sassy Hot Dogs were awarded the JOURNEY Award! PROFESSIONALISM Award! This award recognizes a team whose members show each other and other teams respect at all times. They recognize that both friendly competition and mutual gain are possible, on and off the playing field. 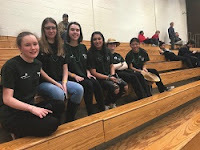 FIRST® TECH Challenge (FTC) 9-12 grades: The Digital Darlings had an exciting season! They participated in two Qualifier Tournaments, they won the DESIGN Award at one and finished in second place overall at another. Their wins enabled them to move on to the championship tournament where they had a fantastic experience! ALL of our teams worked hard and persevered! We congratulate them and thank them for representing Girl Scouts of Nassau County with courage, confidence and character and for showing everyone what a G.I.R.L. looks like! We are very proud of them all! Would you like to know more about our STEM Robotics Program for your daughter or to coach a team? Please join us on June 5, 2018 at 7:00pm, here at the GSNC Service Center, 110 Ring Road West, Garden City, NY 11530. For additional information, please contact customercare@gsnc.org. Ways to say "thank you" to your Girl Scout Volunteer? One of the earliest behaviors my parents taught me was to say “please” and “thank you;” continuously reminding myself and my siblings that these were the magic words. After a birthday party, we would write thank you notes to those who came to celebrate with us. On Mother’s Day, Father’s Day, Grandparents’ Day, Teacher’s day, and all the other “days” of the year, we would say “thank you” to those who were there for us or supported us by giving cards and homemade gifts. April is Volunteer Appreciation Month and April 22 is Leader Appreciation Day which makes it an extra perfect time to say thank you to those Girl Scout volunteers in our lives. Maybe it’s the volunteers who are our cheerleaders, guides, and mentors. Or, that volunteer who helps us build courage, confidence and character. Girl Scout leaders and volunteers encourage us to be G.I.R.L.s (Go-getters, Innovators, Risk-Takers, Leaders). So, this month, and every month, say “thank you” to your Girl Scout volunteer. They go above and beyond to make your Girl Scout experience extra special. Say “thank you” and tell them how they have made your Girl Scout experience special. Hand-make a thank you card. Buy them a volunteer appreciation gift from the GSNC Shop. Nominate a volunteer for the Volunteer of Excellence Award. Throughout April, show your favorite Girl Scout volunteer how much they mean to you with a straight-from-the-heart, personalized ecard. Remember, it’s a fact: without our volunteers, we couldn’t and wouldn’t be the largest girls’ leadership development organization in the world. But we are.